This large tempera on wood, also called Pala Strozzi, was painted in 1423 by renowned artist Gentile da Fabriano, at that time much sought after. The work was commissioned by a wealthy banker and intellectual Palla Strozzi for the family chapel in the church of Santa Trinita. This is one of the greatest masterpieces of international gothic style, with its elegant and fairy tale atmosphere and figures in sophisticated poses. The Adoration of the Magi theme was common since it allowed to hint at the economic prosperity and cultural superiority of who commissioned the work. The procession of the Magi fills the whole composition and is a chance to flaunt plushy clothes and golden decorations. Behind the three Magi we can recognize the portrait of Palla Strozzi in the man with the falcon. The sumptuous clothes of the characters, the refined harnesses of the horses, the description of the landscape and the even more magnificent carved wood frame make this work a veritable masterpiece. 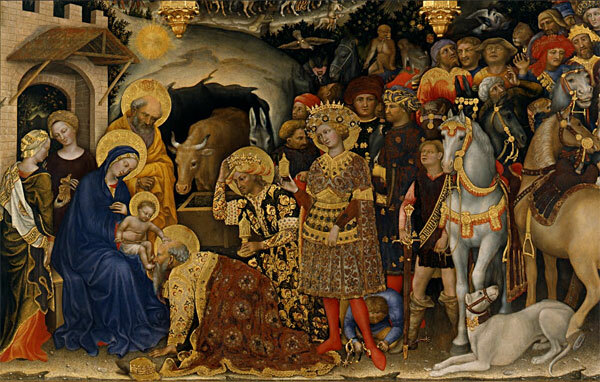 You can see the Adoration of the Magi by Gentile da Fabriano in the halls #5-6 of the International Gothic.